Marble is a glorious living finish. In our kitchen, he brought back to life my Black and Gold Italian Marble counters. After 30 years of cooking and eating meals and partying, the Marble was solid flat black surfaces that absorbed light and were full of even duller acid, water, and oil stains of various sizes and shapes. For a long time, I had convinced myself the marble looked “honed” with an antique well-worn look. But actually, it was more forlorn, colorless, unappreciated, neglected—dead. As a professional interior designer, I had custom renovated our kitchen in my 1923 house. In those years, stone counter tops were just coming into vogue. I hunted down Black and Gold Italian Marble to match the fireplace faces in the rest of the house. I had to have it brought from Italy and it was very expensive. It has actual gold in its veins and easily cracks along those veins. Now, it was the last thing to be refurbished in this 30 year old perfect-for-this-house kitchen and it was to be the topping on the cake. I had worked successfully with many contractors over the years in my work but tolerated them inside my own house. I saw a couple stone installers—“installers,” fabricators, not “refurbishers”—who did not hide their inexperience or lack of know how to exactly bring back” my marble. Frankly, no one was excited to do my marble counters. It was easier to install new stone I was told. Zig Oskwarek was recommended by one of the stone installers who knew Zig was special but did not really know how much. When I met Zig, I was so impressed with discussion of his projects and that he really had “refurbished” a lot of marble, not just granite or other stone. So, I verified my feelings and called his references. Wow! Woman in NYC with marble floors, baths, everywhere in her apartment, badly damaged by former contractors–a lawsuit was involved. To do the job, Zig LIVED at the woman’s apartment, while she travelled outside the country! He “righted” the whole thing. He was a god to this woman. That was it. Zig has a warm personality and I liked him immediately and so did my husband who is Polish also, like Zig. Zig “facelifted” our old Marble with love and attention that highlighted its gorgeous veins of gold and white. Contrary to those lacking expertise, he convinced me it had to be highly polished as it was originally. It is the eye catching star of the room to impress guests. It is equal or better in design and patina to my hand made ebony and brass Italian Empire commode in the foyer. It is like furniture in the room. The mirrored shine reflects hand sanding so unique it is puzzling to stone installers who use mechanical means. All the stains, especially the whitish calcifications around the sink are magically gone. Zig also did a few repairs as possible, as they were delicate and tricky. 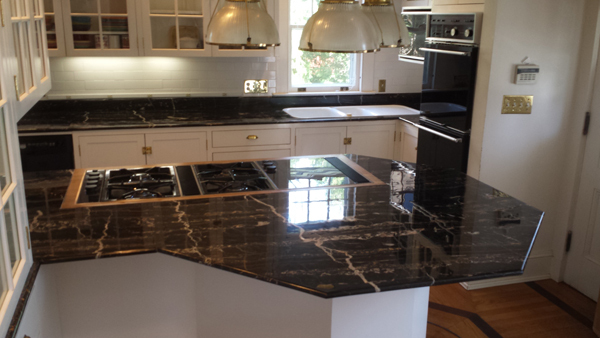 Our special, so very expensive (and rare today) Black and Gold Italian Marble lives and reigns again in our kitchen. Zig is the nicest man in the world. He was a love to work with, very respectful and protective of our things, especially as he had to use other contractors to remove and re-install cabinet doors, etc. He was as neat and clean as possible in a very, very dirty type process. He followed through completely as promised from before our contract. He worked so painstakingly and lovingly with this material. It had turned out to be much harder and more difficult than anticipated–likely because it had set there as counter for 30+ years in solitary confinement, outside its living quarry context. So Zig had to put more time in to accomplish the goal and wasted more diamond discs than planned. Yet, he remained on course, all as agreed. But most awesome was how much he enjoyed working with the Marble, a true artistic and spiritual endeavor which as a designer, I adored sharing with him. And best, the Marble was ours! Zig, the Stone Whisperer, is one of a kind, and as I have later run into others in my industry, found he is highly respected because he is accruing a reputation as being so special. Rozanne N.
The work that you accomplished at my client’s home could not have been better. The final polish is superb and has elicited nothing but praise. Thank you for your expertise. Peter O. Stone and Tile Services did a phenomenal job. What a transformation – our tile floors are bright and look better than the day they were installed Nice people, exceptional service, quality and cleanliness. Ziggy and his team were wonderful. Our granite countertops have never looked better. We thought they looked good when installed; now they really shine. Water beads and cleanup is very easy. You restored the luster to the stone beautifully. You are a true craftsman. The grout work around the kitchen sink and upstairs bathtub were poorly done. Nick did a very professional job. Now the grout work looks great. Thanks again for work beautifully done. Jerry B.
I am writing to thank you for the truly splendid job you did for Jocelyn and myself in restoring our limestone kitchen countertops. As you will recall they were in terrible shape – extensively pitted and irregular with no shine left. Installed over 15 years ago, the surface had become disturbingly difficult to keep clean – a function of the poor status of the surface. After having interviewed two other local tile restorers – both of whom said that it was not worth repairing – we put our trust in your advice and reputation. The results couldn’t have been better. You saved us a minimum of $10,000 – the cost to replace the countertops! It is also worth noting how extremely pleasant it was to work with you – always obliging our questions and schedule. We highly recommend you and your work to any and all. The marble vanity countertop in my bathroom was dull from years of use and etched with stains from contact lens solutions and various cleansers. I had been told for years that the only solution was replacement. Then I heard about Ziggy. 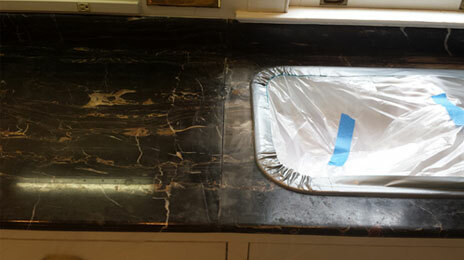 He did a fantastic job refurbishing and polishing the marble to its original gleaming and smooth surface. It now looks terrific. I highly recommend Ziggy – he is very friendly, returned my phone calls and emails promptly, was efficient and neat, and did a truly superb job. I just wish I had heard about him years ago! They have completed two different jobs at my house. Their work is impeccable. The team is great, professional and the work area was clean. I should mention again how amazing the quality of the work is! We just finished a total remodel of our 50 year old kitchen, except the slate floors which I didn’t think were too bad. I thought only the very dirty grout needed cleaning and contacted several tile/stone companies and they didn’t want to do grout cleaning. I cleaned the grout myself (which didn’t get very clean) and discovered that there was a residue on the slates which caused an ugly greenish discoloration that I couldn’t get off. I found a company in Colchester who did restoration and cleaning. They came out and within 30 minutes they gave up telling me they couldn’t get the old residue off of the slate. They packed up, charged me 1/3 of the total price he quoted me, and said he’d check with other people in the industry (because he couldn’t figure it out) and would call me. In the meantime, my kitchen contractor found Ziggy, and after talking with him on the phone, I hired him to do the job of cleaning/restoring both the grout and slate. Ziggy impressed me immediately with his knowledge of stone and the different substances that might be on my floors. He clearly had a wealth of knowledge and knew what he was doing. After he did a test to determine what the residue on the floor was, he proceeded to strip it off. Ziggy took care of everything, painstakingly scrubbing areas that needed to be done by hand, and using floor machines for the rest. Because of his years of experience, he knew which products worked on different problems, and he had his own way of applying the products to produce the most efficient cleaning. In just 4 days of work, Ziggy had stripped, cleaned and sealed my floors. They look great in my beautiful new kitchen! In the beginning, all I thought I needed was whiter grout lines… boy was I wrong! Now, the grout looks almost new and the slates have their color back which matches so much better with my gray lower cabinets. Ziggy, thank you for your professionalism, enthusiasm towards your work, knowledge of all stone and grout, and expertise in using a myriad of products. I whole heartedly would recommend Ziggy to anyone who needs stone/tile cleaning!